I managed to get my hands on some pre-production CX8.4, the newest cyclocross brake from TRP first displayed during this year’s Sea Otter Classic. Arguably tires are the single most distinguishing aspect of cyclocross bikes as they provide traction, suspension, and flotation over various non-paved surfaces impassable to road bikes. However, the brakes on cyclocross bikes have obsessed me for ages. I’ve never been totally happy with any solution so far. I bet hydraulics will be dope in a few years after technology for a shift/brake lever for discs has matured, but in the short run I’m only interested in rim brakes. Several of us at Bike Hugger tried the TRP CX9 mini linear-pull brake, but I for one didn’t like how it meshed with my preferred SRAM levers. The CX9 seems suited to a lever that pulls more cable than a traditional drop bar lever like the SRAM Double-Tap integrated levers, though the newer Shimano 7900 and 6700 levers fare a bit better because of their longer cable pull. When the lever pulls too little cable for the available lever travel, the system will have too much mechanical advantage at the pad/rim interface. The result is that the brakes have a squishy on/off feel lacking modulation and perhaps the pads sit too close to the rim. This balance between lever pull and brake arm length is relevant to all linear pull brakes. 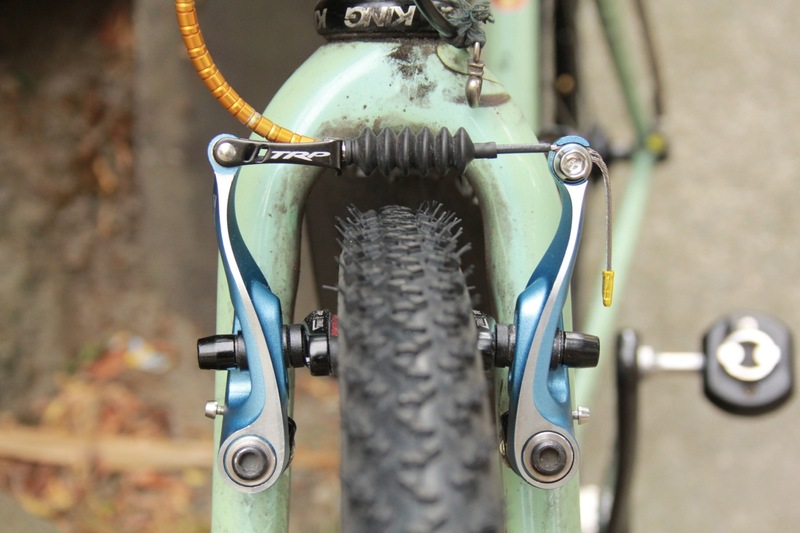 In the 1990s the success of Shimano’s “V-brakes” caused an industry wide change to long-pull levers for mtb, but the road bike standards for drop bar levers remained unchanged. 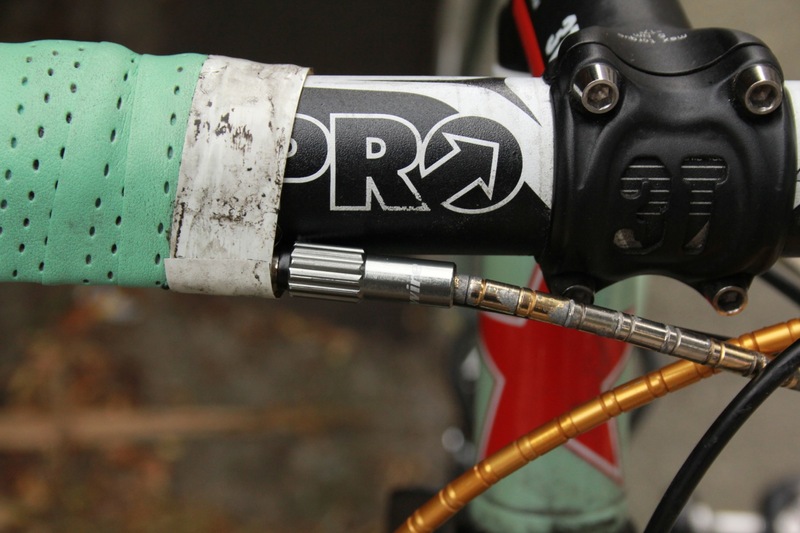 A drop bar lever paired to an XTR V-brake with 110mm long arms is unusable. QBP’s Problem Solvers brand developed the “Travel Agent” cable-pull adapter to solve this, but the device involving a pulley with 2 different radii is bulky and adds weight and friction to the brake system. Yet it does sufficiently reduce the lever’s mechanical advantage to work with a standard linear pull brake, though the mechanical leverage is still a bit high. Meanwhile, component manufacturers such as Tektro and even Campagnolo had introduced a number of “mini-V brakes” with arms less than 100mm to better match dropbar and older flatbar levers (though not necessarily for cyclocross). Often these products were OEM targeted at entry level city bikes, so the price was attractive but the quality somewhat lacking. Then cyclocross reached critical mass about 5-6 years ago, and the aftermarket for exotic CX brakes went red hot. TRP, Tektro’s premium division, trotted out the CX9 mini linear pull brake last year for riders looking for simplicity and power. Though the brakes immediately won a lot of fans among pro and recreational riders, there were still people holding back gushing praise, reasoning that the CX9 didn’t go quite far enough to solve the leverage problems for dropbar levers. TRP has addressed those concerns for 2012 with the new CX8.4 brake ($150 msrp). Whereas the CX9 has a 90mm brake arm, the CX8.4 has 6mm shorter arms, which gives a proportional reduction in mechanical leverage. I’m not sure, but while I know that the CX9 has a less expensive Tektro doppelgänger without the titanium bits and post-anodize machining, the CX8.4’s forged arms might be unique to the TRP cyclocross product. If anything, the CX8.4 bears a strong family resemblance to some of the new integrated TT brakes as seen on the latest Willier crono bikes, rather than being a development of the CX9. The CX8.4’s sleeker, more organic looks certainly win in my book. Even compared to the CX9, these new brakes seem more refined, and all the details just seem right. The arms pivot off of sealed bushings, and the tolerances and finish are spot on. In terms of setup, the CX8.4 is just a v-brake, and I mean that in a good way. Bolt them on, adjust pad height, set pad distance off the rim with cable tension, finished. 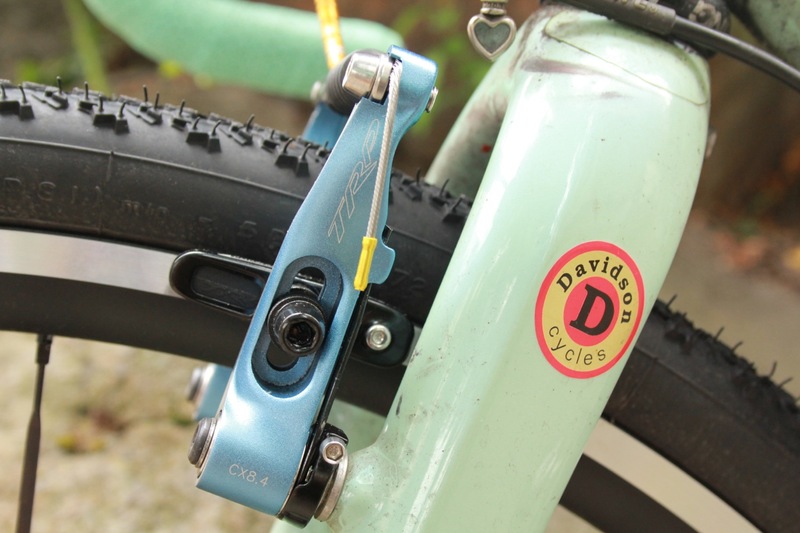 The cartridge brake pad holders take Shimano-type road caliper pads, making it easy to fit rim specific pads like Swisstop Yellow Kings (my favourite for carbon rims), and the holder itself feature presumably weight reducing cutouts. The pad mounting hardware is typical linear pull brake fare. Each arm has independent spring tension adjustment via a 3mm head screw. The anodized blue brakeset I received is supposedly a limited edition. Without all the variables that go into tuning cantilever brakes, the CX8.4 is like a prescription drug for my mechanic’s OCD. On the other hand, these brakes cannot be tweaked to hold the pads far off the rim for mud clearance like wide-profile cantilever brakes. 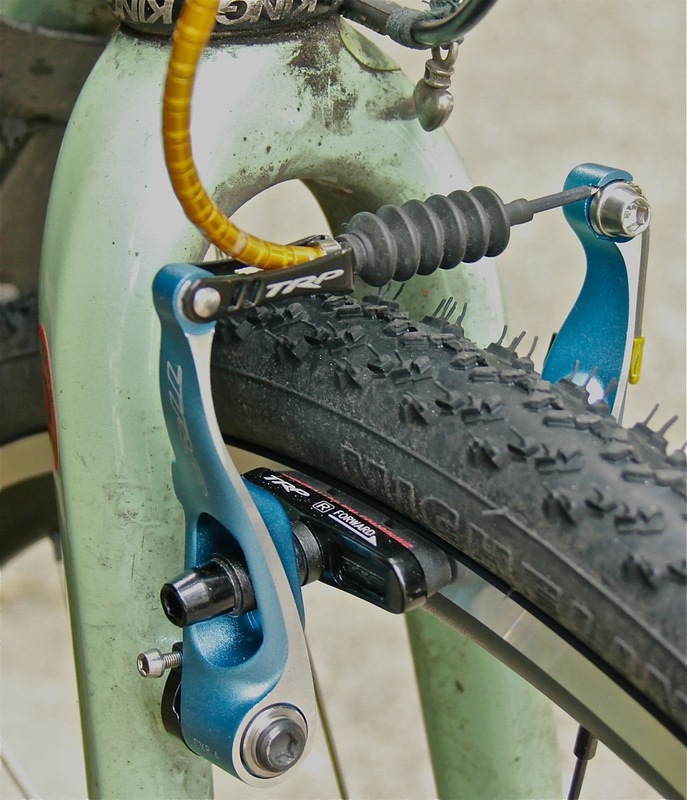 The pad travel is determined by the brake arm length and the lever pull ratio, both of which are fixed. If you try to set the pads too far off the rim, and the lever will bottom out on the bar before you’ll get enough stopping power. Instead of a virtual chasm of rim clearance, you get real braking performance. On a fast course, you can adjust your braking points deeper into the corners, taking a little distance out of your competitors each time. On a wet, loose course, the secure braking power will be less fatiguing when just keeping the bike upright becomes challenging. The pad clearance issue is mainly a problem in deep, sticky mud. If you race in primarily lose-your-shoe-thick mud, then maybe cantilevers would look more attractive. With dropbar levers that have adjustable reach on the lever blade (such as SRAM and newer Shimano) setting the lever’s reach long will get the pads incrementally further off the rim without allowing the lever to bottom out on the bar too soon in the pad travel. Like other linear pull brakes, the CX8.4 has a few other advantages compared to centre-pull cantilever brakes. First, the arms do not extend out beyond the stays or fork blades so they are less likely to snag stuff or get in the way while portaging the bike. Second, since the cable housing feeds directly into the brake, a bike with these brakes doesn’t need cable stops at the headset or behind the seat cluster. This simplifies setup quite a bit, especially if the rider wants to slam the stem down low to the headset. Also, bikes smaller than 50cm start to run out of room for a cable stop between the seat cluster and the brake bosses. Both situations exist on my bikes. Additionally, linear pull brakes are well-known for being less prone to fork shudder versus regular cantilevers. My CX8.4 brake setup is a bit more exotic than stock. I chose to use Nokon housing, which is my favourite for tight cable runs. 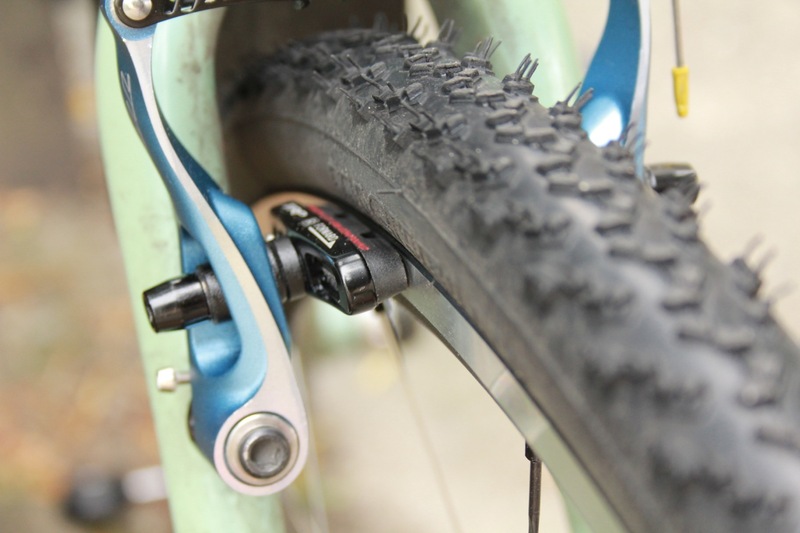 It also removes any perception of housing compression, which is always a boon when too much mechanical leverage is a concern, and it also eliminates the brake noodle. The Nokon is less of a benefit for friction reduction on larger bikes, but as a totally sealed system it maintains that performance like no other. Since I ditched the stock TRP noodle which included a barrel adjuster, I instead spliced a Jagwire inline barrel adjuster into my cable run, placing it right next to where the housing exits the handlebar wrap. Let’s just get it out there: compared to a cyclocross wide-profile cantilever, the CX8.4 is still grabby, and the pads still sit kinda close to the rim. If you swap wheels with different rim widths, you’ll need to adjust the cable (barrel adjusters are very useful indeed). To be fair, I don’t think that it would be practical to reduce the length of the arms anymore because then the cable across the top of the arms wouldn’t give proper mud clearance above a cyclocross tire (and this isn’t the brake for a dropbar 29er or “monster cross” bike with a 2.0+” tire). This doesn’t mean that the CX8.4 fails to accomplish its goal of improving mini-v performance for non-Shimano dropbar levers, because for my tastes this is a great brake. The power of the CX8.4 blows away regular cantis, though I never had any doubt that it would; yet it’s much more controllable than with the CX9. The return spring is firm, ensuring that the pads snap off the rim crisply. 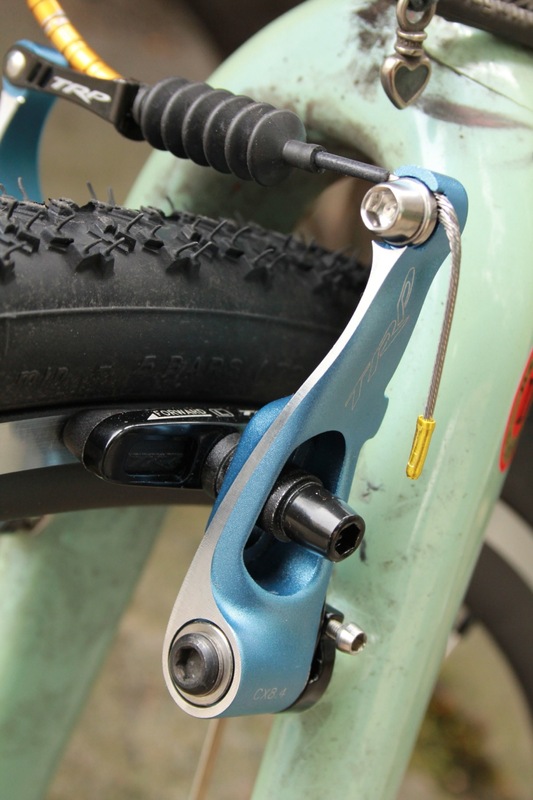 The brake really makes the most out of the cable pull that a SRAM lever can deliver. Compared to my previous setup with XTR M952 v-brake with “Travel Agent” adapters, I knocked off almost 60gr per wheel (CX8.4=169gr with pads/bolts/noodle vs XTR/pads/bolts/adapter=225gr). The leverage feels about the same now; that is to say: noticeably grabbier than a road bike dual-pivot but not ridiculous. It’s annoying only when I first switch from my road bike. Off road, I really appreciate that I can delay my brake points deeper into the turns, but I’m initially apprehensive about overusing the front brake setting up for a turn on dry, but loose surfaces (my personal Achilles heel). But in short order, I’m grooving on it. Then on switching back to my road bikes I am temporarily frustrated at how wussy top-of-the-line road brakes are. Potential users should keep this transition effect in mind, because if you keep a backup bike in the pits you probably want both bikes to have the same type of brakes lest changing bikes throw off your bike handling. It’s plausible that I would like the feel of these brakes even more when mated to the slightly longer-pull of DA7900 or Ultegra 6700 levers, despite TRP suggesting that those levers are ideal with the CX9. Maybe this is just a “Princess & the Pea” situation. To be frank, I’ve made my decision on what levers I want to use, so I won’t be going back to Shimano just to chase a hypothetically more optimal leverage ratio. I’ll be keeping these CX8.4 brakes on my bike for the rest of the year, and I’ll plan on using these on my next cyclocross bike design because they suit my preferences for brake performance. Ultimately, whether you choose the CX8.4, the CX9, or a more conventional cantilever for your cyclocross bike is going to be a matter of personal preference. With the CX8.4, the performance gains are real and the detriments are minimized within the immutable relationships of mechanical leverage. It is a quality product that performs and looks appropriate even next to Dura Ace or Red. If you only race in real mud bogs, you’ll worry that the pads are catching too much mud and maybe you won’t be going fast enough to appreciate this much stopping power. But if you have been disappointed with the power of wide-angle cantilever brakes…if you want real, useable power, this is the brake you’ve been waiting for.